My mom loved plants so much she would rescue dead ones from garbage cans and bring them back to life. She was so proud of them. When I was in school and had to think of a science fair project that wasn’t too sciencey, I decided to play different styles of music to plants to see if they would grow differently. They do actually. As an adult, I have very little to do with plants, because I’ve always been too busy taking care of humans, but my friends who don’t have children are SUPER into plants. This birthday cake for one of those friends. 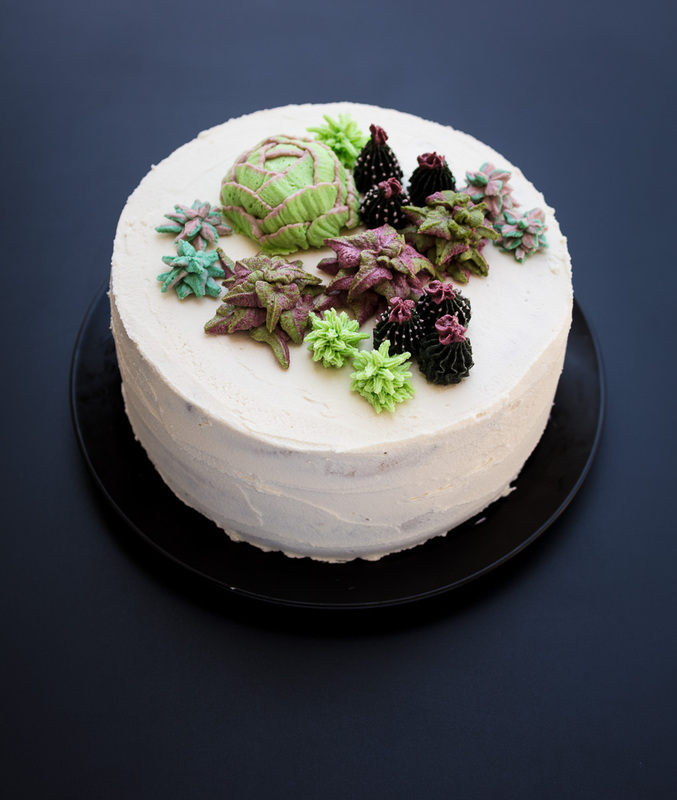 This recipe makes a 2-layer 9” round vegan banana peanut butter cake decorated with succulent plants. I usually make my cakes at night and then decorate them the next day so that they have plenty of time to cool before I remove them from the pans. 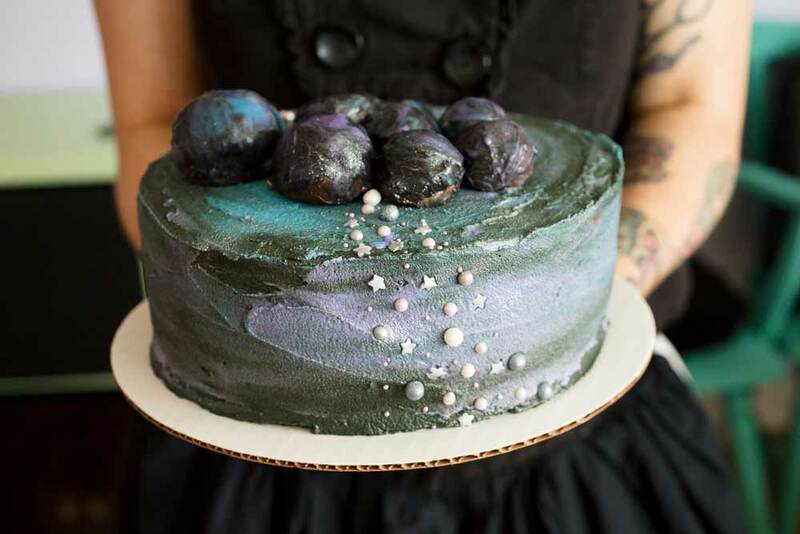 If you aren’t a night person, then start this cake early to give yourself plenty of time. It took me and a friend 2 hours to make all these plants. Combine 1 tablespoon of vinegar with 1 cup of nondairy milk in a liquid measuring cup, stir, and let sit. Whisk 4 peeled bananas in a stand mixer or electric mixer on high until creamy. Add 1 ½ cups sugar to the bananas while still whisking on high. Add 2 teaspoons of vanilla extract to the bananas while still whisking on high. Sift the 3 cups organic unbleached flour, ½ tablespoon baking soda, ½ tablespoon baking powder, ¼ teaspoon of salt into a large bowl and whisk by hand. Pour the cup of milk and vinegar slowly into the banana mixture while the mixer is running. Drizzle the ⅔ cup oil slowly into the banana and milk mixture. Add dry ingredients, half at a time, into the wet ingredients, and mix until smooth. After all the dry ingredients have been added, scrape any stubborn flour that might still be hiding out on the sides down into the batter with a silicone spatula. Mix again until no dry flour can be seen, and then stop mixing. Do not over mix in this step. Quickly divide the batter evenly into 2 round cake pans. Set the cake pans side by side on the same oven rack to get a more even bake. Bake for ~40 minutes, until when you insert a toothpick into the center of one, it comes out clean. I baked mine for 42 minutes. 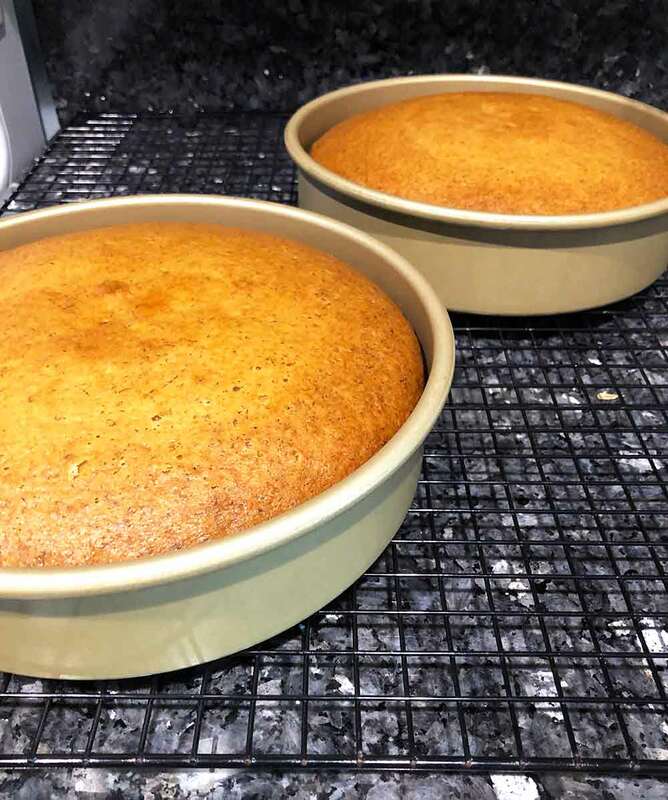 Cool completely by setting cake pans on a cooling rack. If you touch the bottom of the cake pan in the center, and it’s still warm at all, the cakes aren’t yet ready to be removed from the pans. Remove the cakes from the cake pans and then chill in the fridge, covered, until you’re ready to assemble the cake. Whisk the vegan butter, palm shortening, and peanut butter using a handheld mixer or stand mixer fitted with the whisk attachment. Sift in powdered sugar, a cup at a time, adding plant-based milk when it gets too thick. 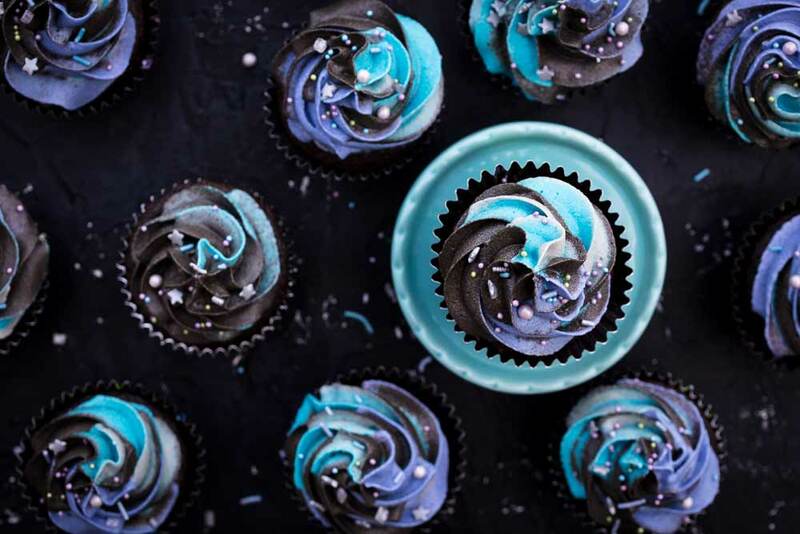 Transfer to a piping bag fitted with a large tip and set aside until the cakes have cooled completely. Pipe the peanut butter filling between the 2 cake layers. 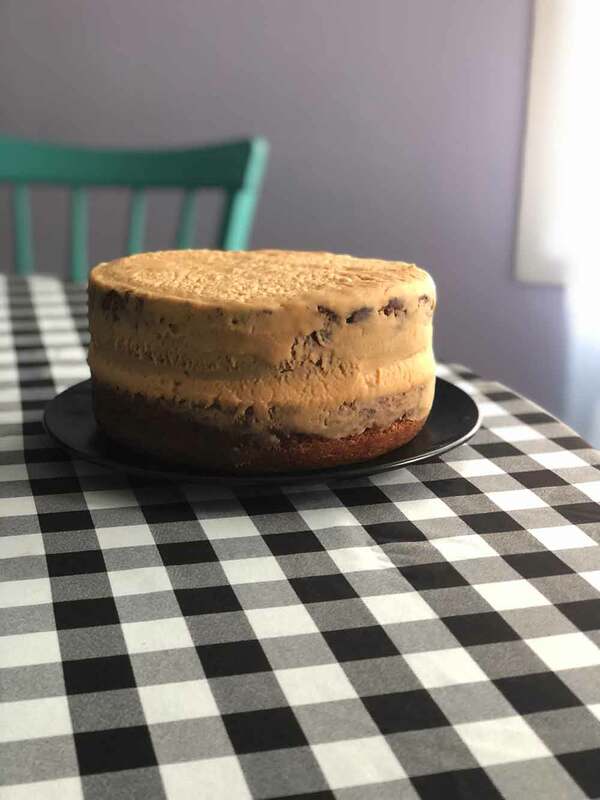 If the cakes aren’t flat on top, use a bread knife to slice the hump off the tops of both cakes before assembling, and put the cut side towards the bottom. Frost the entire outside of the cake by piping the remaining filling all over the outside of the cake and then spreading with an offset spatula . Chill the cake for at least the time it takes you to prepare the frosting. Leave the earth balance at room temperature for 10-15 minutes before starting, if you have time. This isn’t mandatory, but it helps the consistency. Whisk the shortening, earth balance, and vanilla for 1 minute using an electric or stand mixer. Scrape the sides with a silicone spatula, and mix again until light and fluffy. Sift in the powdered sugar, 1 cup at a time, mixing for at least minute between each addition. Start the mixer on the lowest setting so the powdered sugar doesn’t fly everywhere and then gradually increase the speed to high. After mixing in the third and fifth cups, scrape the sides with a silicone spatula, and mix again. Divide the remaining white frosting into 6 bowls. Tint bowl 1 light mauve using Aster Mauve. Tint bowl 2 dark mauve using Aster Mauve. 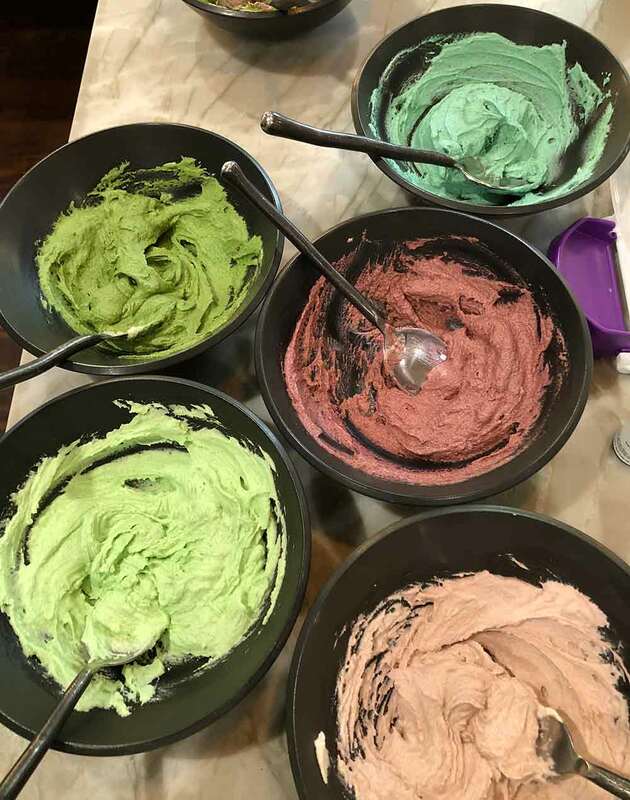 You don’t need as much of this color, so maybe only put half as much frosting in bowl 2 as you have in the other bowls. Tint bowl 3 light green using Juniper Green. Tint bowl 4 dark green using Juniper Green. Tint bowl 5 blueish-green by mixing Sky Blue and Moss Green. Tint bowl 6 dark leaf green by mixing Juniper Green and Leaf Green. Follow these instructions to make each succulent per their recommendations, or follow the instructions below to make them the way I did. Use tip 103 for the echeveria using color 1 and color 3 (the one that looks like a cabbage with pink tips). 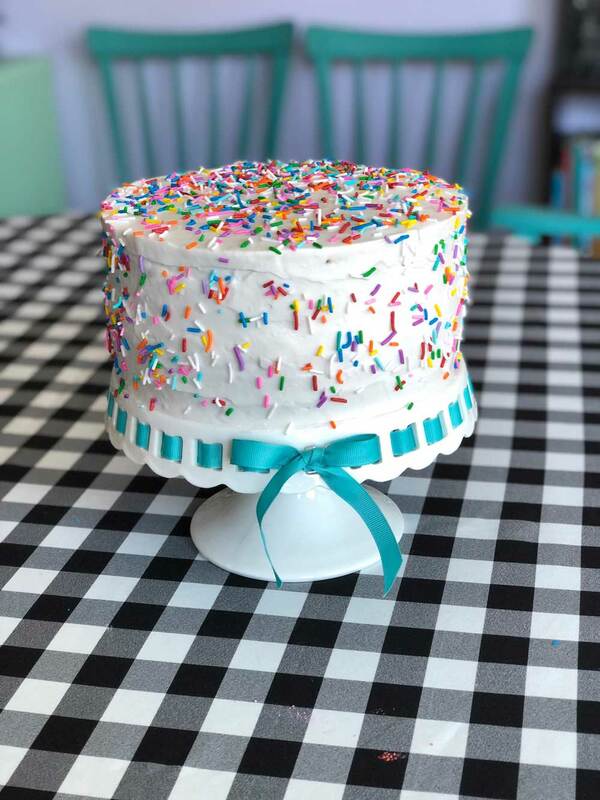 Watch the video to see how to fill your piping bag for this one. Use tip 4b for the dark green cacti, and use tip 1 for the light mauve fuzzies. Top the cacti with color 2. Use tip 16 and color 3 for the light green plants that I invented in my mind. Use tip 352 with colors 5 and 1 to make the pink and ice blue plants I also invented. 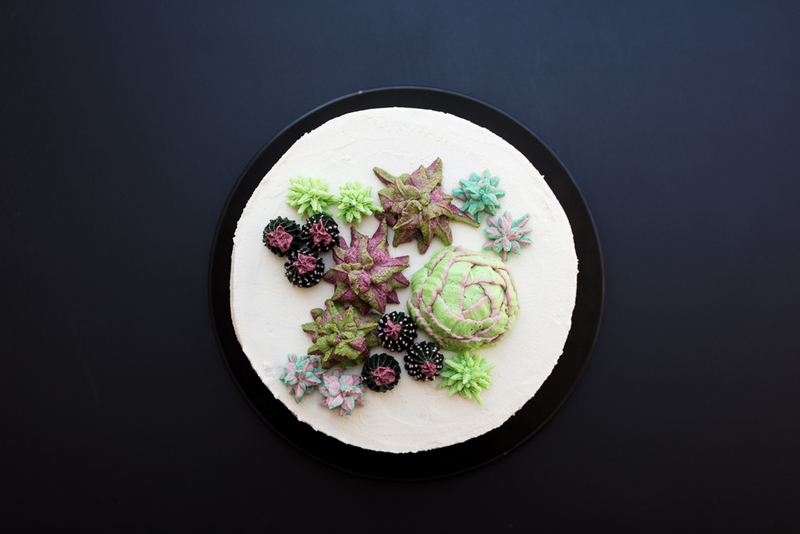 Use tip 352 with colors 6 and 2 to make the dark green and burgundy echeveria plants. Since Jessica specifically requested a cake resembling a banana split, I also made 2 drizzles to bring, and we drizzled them onto each slice. Cool and store in the fridge for up to 5 days until ready to serve. You can also freeze it if you make it in advance, and just leave it on the counter overnight to defrost the night before you want to use it. Combine both ingredients in a saucepan over medium heat or in a bowl in the microwave. Stir until all the chocolate is melted (or if using a microwave, heat in 30-second increments, stirring between each). Store in a jar at room temperature until ready to serve, but if you don’t use it within an hour of making it, it will become too thick, so to get it to drizzle consistency again, just pop it back into the microwave.